Embarking on a new fencing project is always a sure-fire way to add some dynamic contrast, texture and even value to your property. Flourishes like these are important; common sense holds that first impressions linger, and in most cases it’s the fence that you’ll see first. You could go about a new fencing project in a number of ways. But, one of the first things to consider, is the type of material you’ll be going with. Timber and metal offer their own unique advantages. They come at vastly different price points and will add wholly different visual finishes. Oftentimes, many prefer go with what’s comfortable and familiar. Hence the perennial popularity of the classic suburban brush fence. But, for others people, choosing a new fence is a question of stability and security. Before thinking about any construction or purchases though, it’s necessary to have a good long think about what you’re trying to achieve. You could always consider contacting Everlast Services for some professional consultation if you get stuck. In the meantime, run through this checklist to see what you need to work with. Setting up a reasonable budget is going to prevent any heartbreak midway through construction, and the cost of raw materials is a big part of this. The simple fact of the matter is that timber is going to be cheaper than steel, and the same goes for the tools necessary to work with timber. But simply acquiring and putting together all the parts doesn’t tell the whole story. Even if budgets are tight, it’s still necessary to consider the long term benefits of one material over the other. As the old saying goes, you get what you pay for. This brings us to our second point. It makes intuitive sense that metal will last much longer when pitted against the elements, compared to wood which degrades naturally over time. Timber is also susceptible to pests like termites, particularly in urban areas. As such, calling in pest control could very well add to your long term costs. Most wooden fences are made of softwoods which need to be weather proofed, depending on humidity and rain fall levels. This can be done with oil-based sealants or even by painting every couple of years or so. The rule of thumb is that you’ll need to treat a wooden fence as soon as it begins to retain moisture. It’s important to note though that timber is just as easily damaged as it is replaced! Materials like galvanised steel and aluminium are worry-free options that remain steady year round. You’ll need to be wary to make sure that additional components like screws and gates are made of similarly non-rusting materials to save you from more maintenance headaches. There aren’t many things quite as imposing as a metal fence topped with pointed tips or other sharp bits. If you’re concerned about security, a metal fence is your best bet. Unfortunately, timber is quite malleable, particularly if it isn’t properly maintained. This makes it less secure—burglars will be able to circumvent a timber fence easily. Steel and aluminium aren’t quite as easy to overcome—they’re much sturdier and therefore more secure. It’s difficult to determine what looks better—aesthetics depend on tastes and experiences. Some people prefer the homely vibe of a timber fence, can be appropriate with older style architecture. Although, these days, some aluminium fences have been designed to have a wood-like finish (without all the maintenance). On the other hand, the clean symmetry and colour coordination of metal fences can lend a property a distinctively modern edge. You could achieve a similar look with timber too – using heavy lacquering and hardwood slats is an assured, luxurious way to enclose an outdoor lounge area. The aesthetic qualities of the fence will need to compliment the on the house that it guards as much as the material itself. It’s completely understandable to want privacy in your own front yard. Aluminium slat fences are a great way to achieve this. You can achieve almost complete opaque coverage, and muffle nearby traffic sounds. A third option here would be Modular Fencing. Metal fences will usually come with slats and posts as a cost saving measure. So, achieving total visual block-out could look quite cumbersome and overbearing. 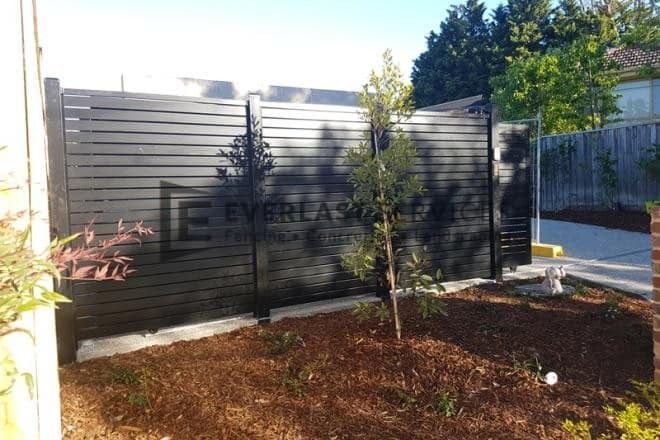 Modular fencing combines the stylishness of timber with the durability of metal to provide a comprehensive privacy-focused solution. Fences are an underrated way to tie up a property’s aesthetic neatly. Whether you’re looking to spruce up the exterior of your home, or make it safer, a fence is a good place to start. There’s obviously quite a bit here to consider depending on individual preferences, means and existing house architecture. If you would like more insights and tips, get in touch with Everlast today.